After learning she is HIV positive, Emebet Geteye became desperate and almost give in to desperation. But her skills and dedication to her craft give her courage to live out her dreams of bringing up her family. “I used to live in a rural village on the mountain with my husband. It was during my pregnancy checkup that I found out that I am HIV positive and so is my husband. During this time my family I and had faced lots of difficulties and we struggled to survive. I went to the mountain to seek for the holy water from the church, hoping I would be healed. But at some point I got much discouraged and lost hope. I did not know how my life would go on. But then I had the chance to join Entoto Beth Artisan. My whole life took a different direction. It brought out the other side of me and changed my attitude toward life. Now I am creative, producing beautiful jewelry and beads that we are selling and exporting with great ambition. Now we have a stable life and comfortable living. 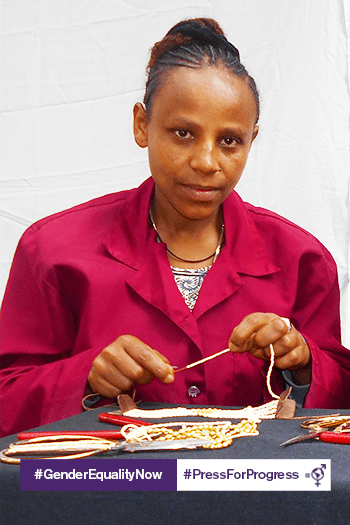 Thanks to EBA, now I have achieved my dreams of supporting my family."